You need to let the interviewer know why they want you for the position. The interviewer not only want to know the reason why you want to work with their company but also want to know the reason why you want this particular role. So, It is good to make a realistic choice because you may be asked to give elaborate answers. Select a few key factors to incorporate into your pitch for why you’re a good fit. ===>> Fixed - Asked HR Interview Question | How much work experience do you have? / Tell me about your work experience? ===>> Job Interview Tips 2019 | What Have You Learned in Your Last Job? ===>> HR Interview Question For Network Engineer | Why did you choose a career as network engineer? ===>> Frequently Asked HR Interview Question in January 2019 | What were your responsibilities at your previous workplace? ===>> Trickiest HR Interview Question Recently Asked in January 2019 | Do you know anyone who works for us? ===>> Updated - HR Interview Question 2019 For Finance Job | What made you choose to apply for this Finance job? ===>> Updated - HR Interview Question 2019 For Any Job | What does customer service mean to you? ===>> Tricky HR Interview Question With Answer- What are your career goals and how long do you plan on staying? ===>> New 2019 Behavioral Interview Questions -|Are you a Successful Person in your Job Role? ===>> Situational Interview Question | What is the most competitive work situation you have experienced? How did you handle it? What was the result? ===>> Job Interview Tips | Interviewers primarily evaluate the following things. ===>> Most Commonly Asked HR Interview Question To Answer | Do you have any question? ===>> Job Interview Tips Q&A for Computer Based Jobs - What to do when a program stops responding? ===>> Most Asked HR Interview Question To Answer | Assuming that you are selected, what will be your strategy for next 60 days? ===>> IQ Aptitude Question With Answer- A man got killed in his offic..
===>> Job Interview Tips Q&A: Describe a major problem you experienced with an employee at work and how did you handled it? ===>> Job Interview Tips | Situational Interview Questions & Answers - Are you willing to take risks? ===>> Job Interview Tips | Must Know This - What are the trickiest questions that tech companies will ask in a job interview? 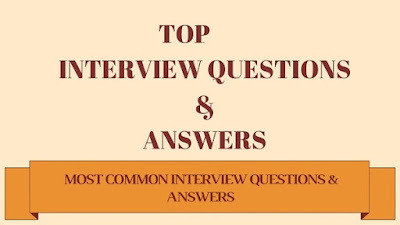 ===>> Job Interview Tips | HR Interview Questions & Answers - How did you hear about the position? ===>> Job Interview Tips | The Most Asked Interview Questions & Answers For Managerial Position - Describe Your Management Style? ===>> Job Interview Tips (Q&A): Tell about Your Future Goals - What are your goals for the future? ===>> Most Common Question For Civil Engineers - What is the difference between a Civil Engineer and an Engineering technician? ===>> Job Interview Tips Q & A: Tell me Something which is not on your resume? ===>> BEHAVIORAL Q & A - Describe the most difficult challenge you have faced. Explain why you believe you met or failed to meet that challenge! ===>> JOB INTERVIEW TIPS: Q and A | When were you most satisfied in your job? ===>> Situational Interview Question - Describe a time a customer wasn't happy and what did you do to change that? ===>> How To Interview - And Get the Job at BBC? ===>> How to Answer Salary Interview Questions: How Much Should We Pay You? ===>> BEHAVIORAL HR INTERVIEW QUESTION UPDATED - What type of people do you find it difficult to work with? ===>> FREQUENTLY ASKED HR QUESTION 2018: What did you dislike about working at your former employer? ===>> TOP BANKING INTERVIEW QUESTION - How is Technology impacting the Banking sector? ===>> FREQUENTLY ASKED IN FINANCE INTERVIEW | Why would two companies merge?